As you can probably guess from the name, parrotlets are a very small type of parrot. These birds are the smallest group of New World parrots, having stocky builds and short tails. In the wild, parrotlets are known to travel in flocks of up to several hundred birds, and they form tight, lifelong bonds with their chosen mates. Though small in size, parrotlets have big personalities and make great pets. Caring for parrotlets involves choosing a high-quality diet to meet the bird’s nutritional needs. Read on to learn more about parrotlets and their dietary requirements. You’ll also see our top 5 picks for the best bird food for parrotlets. 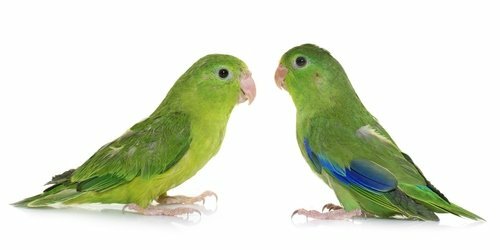 What Do You Need to Know About Parrotlets? How Much Should You Feed Your Parrotlets? How Many Times a Day Should You Feed Your Parrotlets? Parrotlets look very similar to parakeets in both size and body shape, but they are actually very different. These little birds only grow to 5 inches in length, and they are not quite as common as parakeets. There are several different species of parrotlet, but only two of them are easy to find in the pet trade – the Pacific parrotlet and the green-rumped parrotlet. In the wild, parrotlets form strong bonds with their chosen mate. Individually, parrotlets make great companions for their owners, though they can be feisty and willful at times. Hand-fed parrotlets tend to be the friendliest, and these birds tend to lose some of their companionability over time if left alone too long. Many owners choose to keep pairs or small groups of parrotlets. Though parrotlets may be small, they require a significant amount of cage space. These are very active and playful birds, so they need plenty of space as well as toys to keep them busy. In terms of other care requirements, parrotlets need a healthy, balanced diet. The ideal diet for parrotlets is a nutritionally balanced pellet supplemented with seeds, fruit, and vegetables. These birds also need a source of calcium such as a cuttlebone. As is true for all birds, variety is key to ensuring that your parrotlet gets the nutrients it needs. Nutritionally balanced pellets – Commercial bird pellets are designed to provide balanced nutrition in every bite, so they should make up 75% to 80% of your bird’s diet. Variety of seeds – Including small amounts of mixed seed will give your parrotlet something new to eat and a variety of different nutrients. Variety is particularly important if you choose not to feed your parrotlet nutritionally balanced commercial pellets. Fruits and vegetables – Any diet for parrotlets should be supplemented with fresh fruits and vegetables to provide key nutrients. Source of calcium – Parrotlets require a source of calcium, ideally a cuttlebone. Keep reading to see our top 5 recommendations for the best bird food for parrotlets. It is your decision whether you feed your parrotlet commercial pellets or a seed-based diet. Commercial pellets ensure that your parrotlet gets the nutrients it needs in every bite, though some birds are hard to transition onto a pelleted diet from seed. Regardless which diet you choose, make sure you feed your parrotlet a high-quality product. 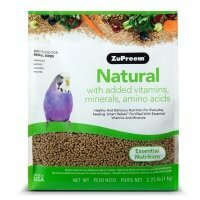 If you’re looking for a wholesome and healthy way to provide for your parrotlet’s nutritional needs, this ZuPreem Natural Bird Food for Small Birds is one of the best options. These commercial pellets are nutritionally balanced to ensure that your parrotlet gets all of the nutrients it needs in every bite. This formula is uniquely developed for small birds, so not only does it provide the right blend of nutrients, but the pellets are perfectly sized for parrotlets. Each pellet contains a precise blend of grains and vegetables and this formula doesn’t contain any artificial preservatives – the only additives are vitamins and minerals that your bird needs. Parrotlets are very small birds and it is important to help them maintain a healthy weight throughout their life. 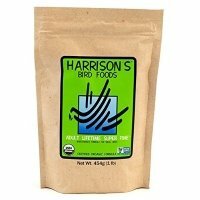 That’s why this Harrison’s Bird Food Adult Lifetime Super Fine Pellets is a great choice, because it is designed for maintenance. It contains all of the nutrients your parrotlet needs for balanced nutrition and good health without excess vitamins or minerals. This formula is uniquely designed for small birds like parrotlets and for non-breeding, non-molting birds. It is completely free from chemicals and artificial ingredients, so you can rest easy knowing that your parrotlets are only getting the best of the best. 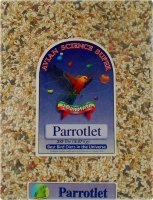 If you prefer to feed your parrotlets a seed blend rather than a commercial pellet, this Volkman Seed Company Avian Science Super Parrotlet formula is a great option. It features a wide variety of seeds including safflower, sunflower, and pumpkin as well as a mixture of grains like buckwheat, corn, and wheat. Each bag also contains a blend of nuts and dried fruits and vegetables to ensure nutritional balance throughout the formula. The only potential problem is that it comes in a 20-pound bag which may take quite a while to use if you only have one or two parrotlets. 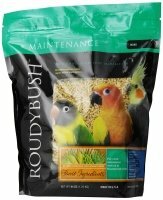 For a nutritionally balanced diet for your parrotlet, consider this RoudyBush Daily Maintenance Mini Pellets formula. This formula is uniquely designed for birds 3 inches and larger, including parrotlets, so it comes in a miniature pellet and can also be broken down into crumbles. These pellets are completely balanced in terms of nutrition, so you don’t need any supplements. The recipe is scientifically formulated and doesn’t contain any added sugars, colors, or artificial preservatives. 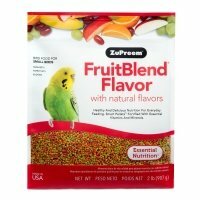 If your parrotlets prefer fruit flavors over traditional pellets, this Zupreem Avian Maintenance FruitBlend Diet for Small Birds is a good choice. This formula consists of nutritionally balanced pellets with a unique fruit blend flavor. Your parrotlets will find the flavors they like but you’ll rest easy knowing that the bird’s nutritional needs are being met. Each bite contains 21 vitamins and minerals and there are no artificial preservatives or unnecessary ingredients. Parrotlets are very small, so they don’t require a large volume of food. The amount you feed them depends on whether you’re feeding a seed blend or pellets, but for the most part you’ll be feeding your parrotlet about 1 to 3 tablespoons daily with small bits of fresh fruits and vegetables. Most birds tend to eat small amounts throughout the day, so plan to feed your parrotlet a day’s worth of food once a day and let the bird eat as it likes. Provide fresh water on a daily basis and make sure to thoroughly clean the food dish before refilling it. When it comes to feeding your parrotlets, you need to decide between a commercial pellet and a nutritionally balanced seed blend. Whichever you choose, make sure to select a high-quality product. If you’re not sure where to start shopping for parrotlet food, try one of our top 5 picks reviewed above!